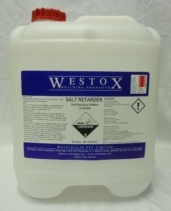 Salt Retarder additive for render which discourages the salt from moving to the new surface. Used in render after Westox Chemical Injection System. One part Salt Retarder to forty (40) parts water. 500mls to 20 Litres water. Three parts sand to one part cement (GP).